Said Fiat-Chrysler CEO when asked about the company's 2012 outlook: "Globally we'll be fine." 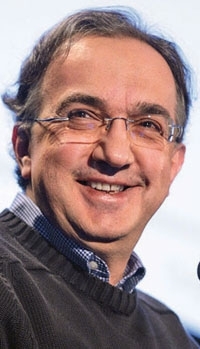 MILAN -- Fiat S.p.A. CEO Sergio Marchionne said the outlook for profitability at the carmaker's European business is uncertain and said a merger with Chrysler Group is not on the agenda for 2012. "More than volumes, the question is whether we can extract the same levels of margins," Marchionne, who heads both Fiat and Chrysler, said Monday in an interview in London. "We are to some degree cautious on what is possible from Europe next year." The CEO said Turin-based Fiat's next forecasts will be "a range, as we need to be prepared for the possibility that the market in 2012 may not be where it is now." Marchionne, 59, is planning to merge the two carmakers by the end of 2014 to reduce costs and achieve a target of more than 100 billion euros ($135 billion) in revenue as he struggles to end Fiat's European losses, which analysts estimate at 800 million euros a year. Fiat, which owns 53.5 percent of Chrysler, expects to get to a 58.5 percent stake by the end of the year after meeting performance targets. Marchionne said Monday that the merger of the two carmakers and a purchase of the United Auto Workers union's retiree healthcare trust's stake in Chrysler is not on the agenda for 2012. The company isn't planning to raise cash to buy the stake and isn't planning to increase its capital, the CEO said. "The real concern is not so much the margin level in Europe next year, but the extent to which Fiat will consume cash in a downturn," said Erich Hauser, a Credit Suisse analyst in London. "If volumes fall further, then Fiat's liquidity position could become an issue." Marchionne said he expects a "great year" for the U.S. car market next year, while Europe is a "wildcard." "Globally we'll be fine," he said when asked about the outlook for 2012. He also said the crisis isn't delaying the merger of Fiat and Chrysler. Chrysler's rebounding sales are helping prop up Fiat. Third-quarter earnings before interest, taxes and one-time items, which Fiat calls trading profit, rose to 851 million euros from 256 million euros a year earlier, with the U.S. company contributing 65 percent to the overall result. Fiat fully consolidated Chrysler's results from June. The CEO also said Italian Prime Minister Mario Monti "has the experience to manage Italy through these difficult times." Marchionne said Monti has full support from Fiat.